We did it! 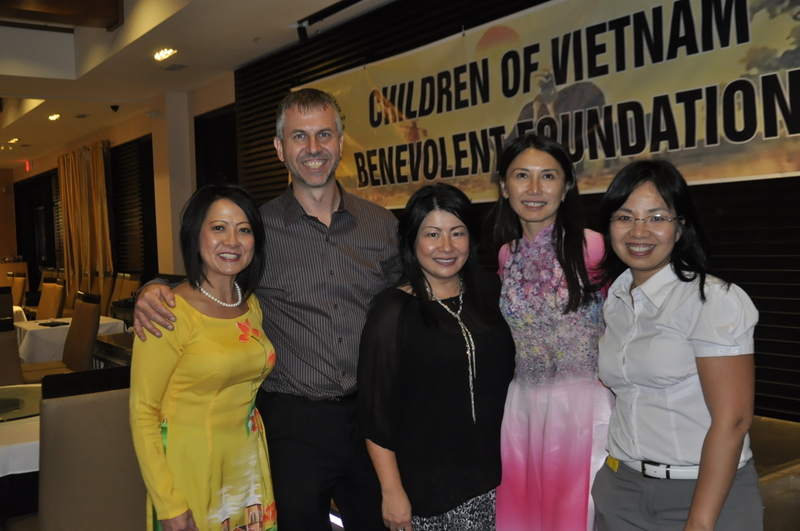 We cannot believe the incredible support we received last night at our Children of Vietnam Benevolent Foundation fundraising dinner! Together we raised over $38,000, far exceeding our goal for this year. We are so touched by the generosity and kindness of all our friends and families who were with us last night. How do we thank you enough for taking the time to make beautiful quilts, paint amazing images, build wonderful things, cook and bake delicious jams/pastries, among so many other things — including 3 gigantic pumpkins — you have gathered for us to help make this night a great success? Then there were the beautiful holiday rentals from Henry & Leona Heuver and Penny & Rick Highet. 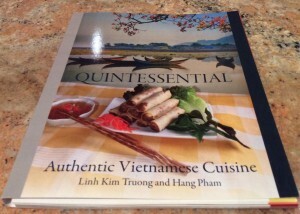 And what can we say about our incredible friends Thao & Steve Choi who not only flew all the way from Oakville, Ontario to support us, but also gave all the proceeds from the sales of their book to our foundation last night. Our beautiful dancers – Amy Duongand the QeM Dance Group, we so admire your beauty and talents. And all the friends who graciously drove up from Calgary and surrounding, we are so grateful to you. The strength and courage we had last night also comes from the countless amazing friends and family who were with us in spirit. Thank you Kevan Rapley for taking the reins on our live auction , the talented duo anh chi Truc and Thuy for the beautiful songs and the talented Kathy Elle for being our great master of ceremony. And many thanks to little Nathan Pham for making all those beautiful rainbow loom bracelets and little Kenya Davies for painting a Vietnamese landscape to help make the fundraiser a great success. Good evening. What an honour it is for us to once again be in the presence of such wonderful friends, family and honoured guests. We are most humbled by those who have returned this year to continue on this journey with us, and grateful to all who are joining us for the first time. This is a very special dinner for us tonight because it is our very first gathering as an officially registered Canadian Charity. Although we have been given charity status, none of the members of the Foundation feel that our goal is to simply be charitable. We are here today because we all feel an obligation to work– to do what we can, the best we can — to help create a more equal society, free from hatred, ignorance, poverty and injustice. When I think about what’s going on in the world with ISIS, the Syrian war, Ukraine and Russia, Israel and Gaza, I sometimes feel that perhaps what we are doing or wanting to achieve in this small, distant country is not so important, when there are so many other needs and much suffering in the world. The more I think about it, the more I am frustrated and saddened that somewhere, out there on this planet of ours, human beings are waging wars and killing one another, year after year. These atrocities result in millions of innocent lives taken and innocent people driven from their home and homeland. But the more I think about this, the more I am reminded that this is precisely the reason why our Foundation came into being and what we aim to do is critical in breaking the cycle of poverty, violence and injustice. You see, many of us Vietnamese-Canadians here tonight and throughout Canada had come to Canada as refugees, driven from our beloved homeland more than 30yrs ago as a result of the Vietnam War. All we had, as we clung to each other in the stale, foul air within the enclosed boats, battered by the rough seas, was hope. Hope that we would find land. Hope that we would find freedom. Hope that there is a tomorrow, for our children, and our children’s children. What gave us refugees more hope, as many of us languished in the refugee camps, was when kind-hearted Canadians reached out from across the seas and sponsored our families to this land of opportunity. In fact, some of those generous Canadians are here tonight — Father Gauthier, the Baril family, the Heuver family, the LaPerle and the Zyp family. When we ourselves become skeptical about whether anything we do would make a difference in anyone’s life, be inspired by these individuals. All that we have accomplished, all that we’ve become, all the smiles on our children’s faces today are because these caring individuals had touched our lives and given us hope when we needed it the most, some 30 yrs ago. To honour our homeland, to honour the sacrifices and hardship endured by our parents, to honour the kindness of these remarkable humanitarians, it is our Foundation’s mission to pay forward this kindness by giving hope back to the children of a country that was so devastated by war. They are our little brothers and sisters, and sadly many still live in substandard conditions due to the growing economic disparity in a nation being rebuilt. 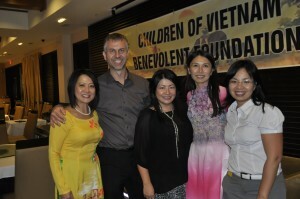 Last December, as part of our Foundation’s first visit to Vietnam, Grant and I visited four orphanages. It was an emotional experience because we realized that we have lived a sheltered life. So many abandoned or orphaned infants lined up in barren cribs, peering out at us with their beautiful innocent eyes, yearning to be held and cuddled. Little did they know that they have no one to call “mom”, no one to call “dad”. Disabled children left to lay most of the day in similar cribs, with the only thing to cling to are the metal railings of their beds . 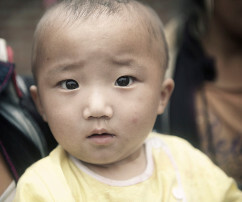 Then there were the children whose faces we had already seen in pictures. We found ourselves drawn to them because of this prior connection. We were moved to have finally met them, to embrace them, but an overwhelming sense of guilt filled our hearts in the end because at the end of the day, we were going home, back to our good life, while they remained behind closed doors. It is hard because we know that what we’re trying to do to help these disadvantaged children remains far from adequate on so many levels, but perhaps with us helping to feed them, they will have better health to hope. Perhaps if we help them finish their education, they will know there is hope. Perhaps if we visit them, their days will be filled with hopes. When there are so much need in the world, here and abroad, when time is so precious, how do we thank each and everyone of you enough for taking time out of your incredibly busy day, for flying across the country or driving hundreds of kilometers to walk on this journey with us? With you as part of our efforts in our first year, we were able to help the children in the orphanages in Vinh Long, Ca Mau, and Bao Loc. We helped fund the education of girls living at Lang Son and Dak Glei residential schools, where they are protected from human trafficking. We gave $6000 in scholarships to students in the southern provinces of Ca Mau and Can Tho to help them continue their education and to pursue a post-secondary education. We donated $500 worth of books to a school library and contributed to the building of an early education centre in Kon Kloc. Mother Teresa once said “we can do no great things, only small things with great love.” In this world, when the ignorant continue to take up arms to wage wars, may we raise our arms and lift our children by giving them hope and opportunities through love, education and the provision of basic needs. Only then will we empower our children to create a more peaceful society, free from hatred, ignorance, poverty and injustice.